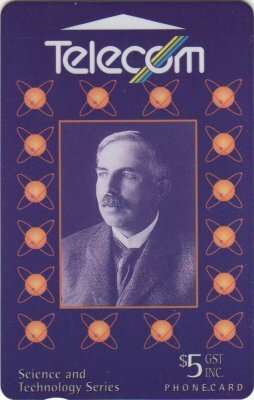 Sir Ernest Rutherford, born 1871, died 1937. In 1911 Rutherford worked out the theory of the atom. This card was released to honour him. There are two different reverses for this card. 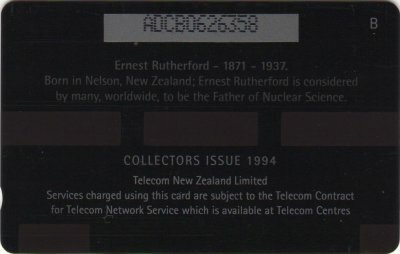 One with Telecom Corporation Of New Zealand (1st Back), and the other with Telecom New Zealand (2nd Back). The one shown above is the 2nd Back. also overprinted Collectors Issue 1994. There was no difference between the the two Collector Pack versions.